SINGAPORE'S financial sector is expected to continue outpacing the growth of the overall economy, with the Monetary Authority of Singapore (MAS) on Monday unveiling strategies to raise the Republic's status to a top global financial centre in Asia. The aim is to achieve growth in the financial sector at an annual 4.3 per cent - on a real value-added basis - and hit a productivity rate of 2.4 per cent annually. Both are above what is expected for the overall economy. Singapore's economic growth in 2017 is expected to be between 2 per cent and 3 per cent, and productivity rose by just one per cent last year, after several years of negligible growth. Singapore will also aim to create 3,000 net jobs in financial services every year, as well as an additional 1,000 net jobs in the fintech sector annually. "Prospects for the financial sector are good. Asia's growth continues to be strong, driven by a growing middle class, rapid urbanisation and the expansion of Asian enterprises, which will generate demand for financing and risk management solutions," MAS said in a media statement. "However, the sector is going through a period of significant change. With technology transforming the way financial services are produced, delivered and consumed, it is critical that Singapore's financial sector also transforms, to stay relevant and competitive." 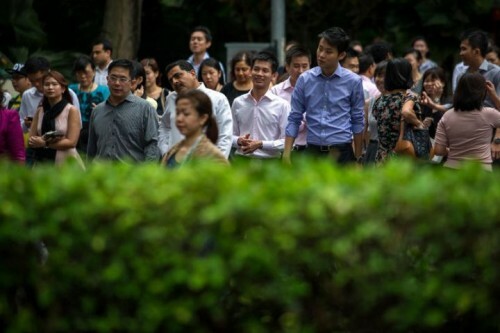 Singapore plans to develop into a leading international wealth management hub, building up the talent pool to provide comprehensive and high-quality wealth advisory services. As the third-largest forex centre globally, Singapore wants to have key forex players anchor their matching and pricing engines here, with Asia expected to attract a larger share of global investment flows. It also wants to build private market funding platforms to enable Asian growth companies to gain better access to a wider network of investors, such as venture capital funds. On the innovation front, the MAS will work with financial institutions to create common utilities, such as for electronic payments, digital ID, and electronic know-your-client checks. It will also look to use technology to simplify financial institutions' regulatory compliance. The MAS said that it will continue to work with financial institutions, tripartite partners and schools, to build a local pipeline of specialised talent, particularly in information technology; reskill and redeploy professionals into job growth areas through professional conversion programmes; and help to bring about job placements through greater career advisory services. The projections and strategies make up the industry transformation map (ITM) for financial services, part of a broader national strategy to restructure the economy. Ong Ye Kung, Minister for Education (Higher education and Skills) and Second Minister for Defence, said at the launch of the financial services industry transformation map: "This is an ambitious target, given the significant changes happening in the industry. But we are determined to be net gainers in this era of change. " OCBC told The Business Times on Monday that the average number of man-days of training per employee achieved in 2016 was 7.8 days, well above the target of 5 days. "OCBC Bank's efforts to build a future-ready workforce have been on-going for the last few years, and we have invested in different programmes and initiatives that cover areas including digital and fintech-related learning and development programmes and workshops, skills-building, HR digital enablers and internship programmes," said Jacinta Low, head of HR planning, OCBC Bank. "We have an innovation lab that allows staff to brainstorm and incubate ideas, and there are the latest gadgets for them to experiment with and explore to see how they can apply in their line of business." DBS pointed to its announcement in August to invest S$20 million over five years to re-skill employees to have them ready for the digital workforce. Sim S Lim, DBS Singapore country head, said that the efforts will help employees to "thrive in the digital economy and adapt to the future of work". DBS has also collaborated with the IMDA (Info-communications Media Development Authority) to introduce the industry's first fintech training programme to young professionals in technology skills. "For Singapore to become a leading global financial centre in Asia, it is crucial we focus on building a strong talent pool with the right technology and innovation skill sets," said Mr Lim. Wee Ee Cheong, deputy chairman and CEO, UOB, said: "We welcome the financial services industry transformation map as it represents a concerted effort to ensure that the industry is prepared, businesses are supported and our people are ready for the future."